I had sixteen wreaths hanging in our home for Christmas and the minute I took them down our house looked so empty. 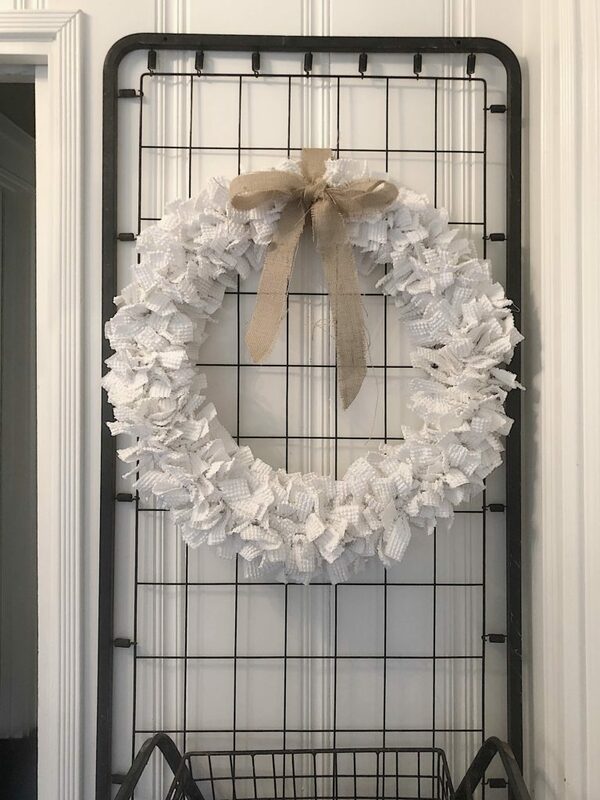 So I decided I needed a winter themed wreath and I just love this DIY. 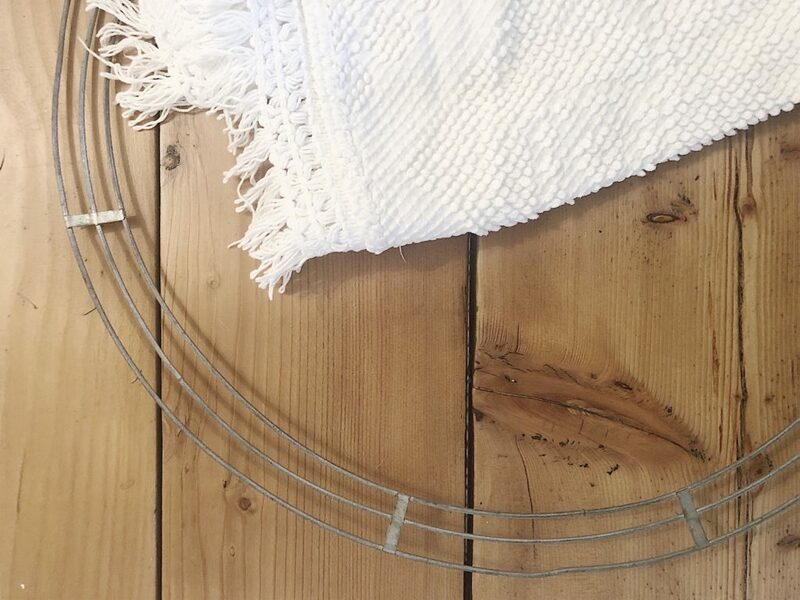 I pulled out one of my old flea market bedspreads and came up with a DIY to make a chenille wreath. This is so easy. There is no sewing, just tearing fabric and tying knots. That’s it! 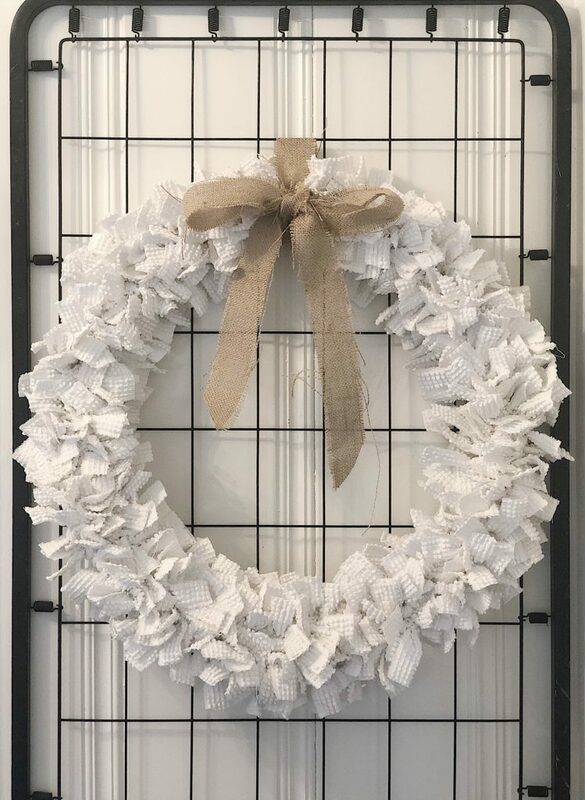 I am also part of a Winter Themed Wreath Blog Hop and I am so excited to share the gorgeous wreaths made by my friends. This quick and easy arm knitted wreath was made by my friend Janine at Happy Happy Nester. I love the thick wool yarn Janine used to make this adorable wreath! 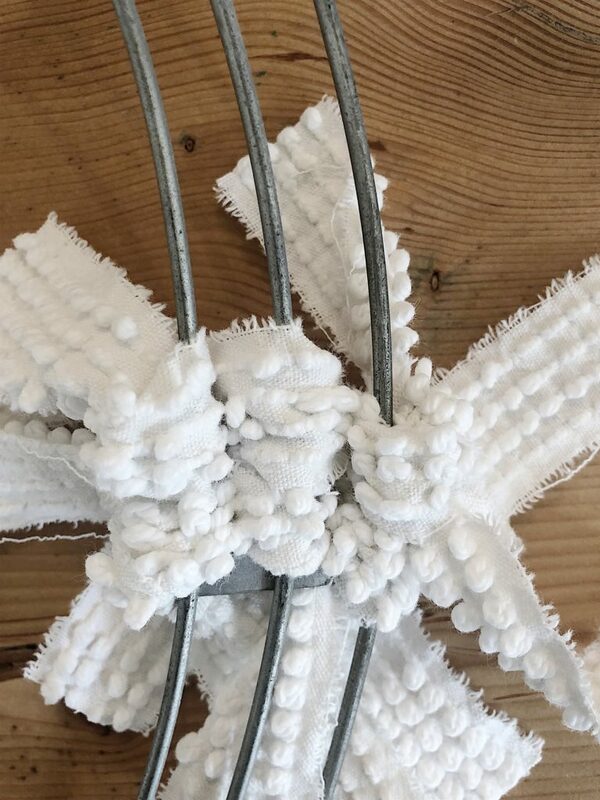 Jen from Tater Tots and Jello made this Popsicle Stick Snowflake Wreath. It is so adorable and I love that she painted it black! 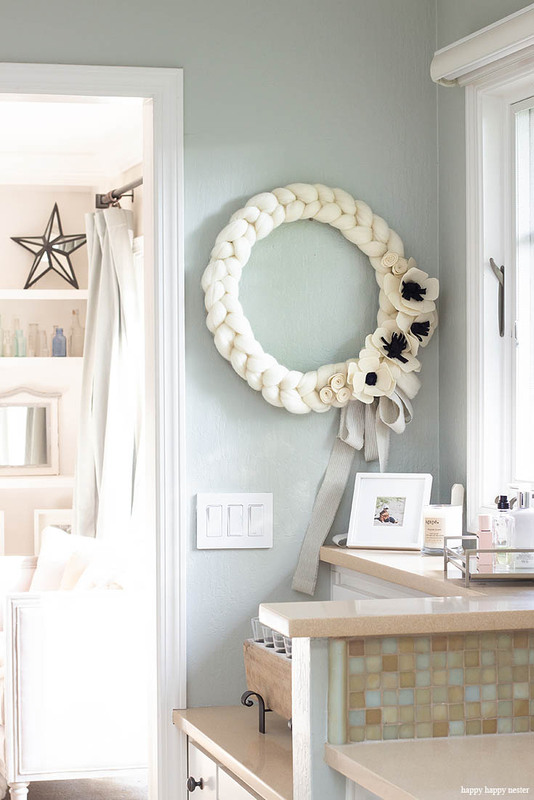 This Winter Pom Pom Wreath DIY was created by Ashley at Modern Glam. I love how she added the small trees and house. This is fantastic and I can’t wait to read her DIY. Rhonda at Hallstrom Home made this Tissue Paper Flower Wreath. 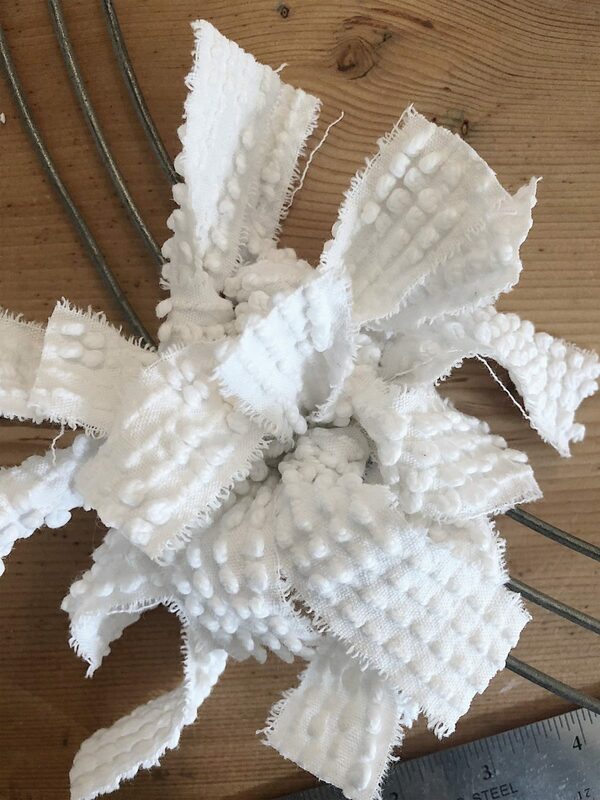 I have never made tissue paper flowers but will be making them next month! I cannot wait. 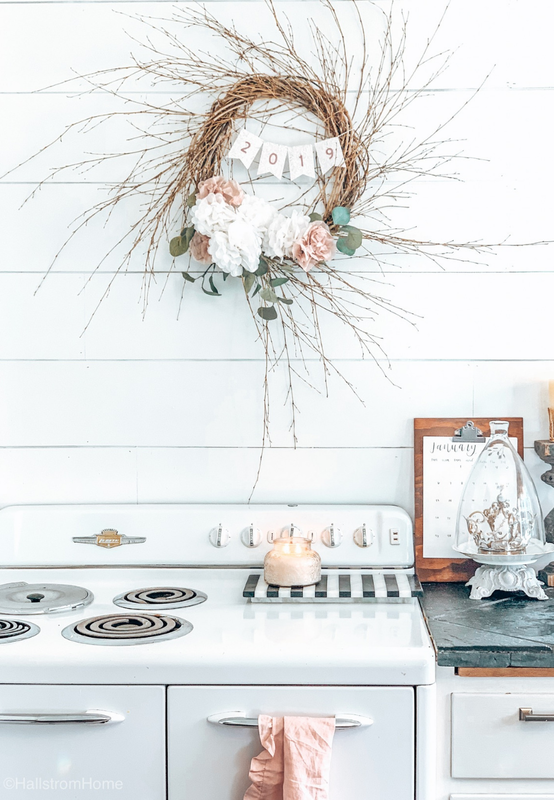 Tauni Everett made this Winter Wreath and I love the natural look and feel it has. Wow. 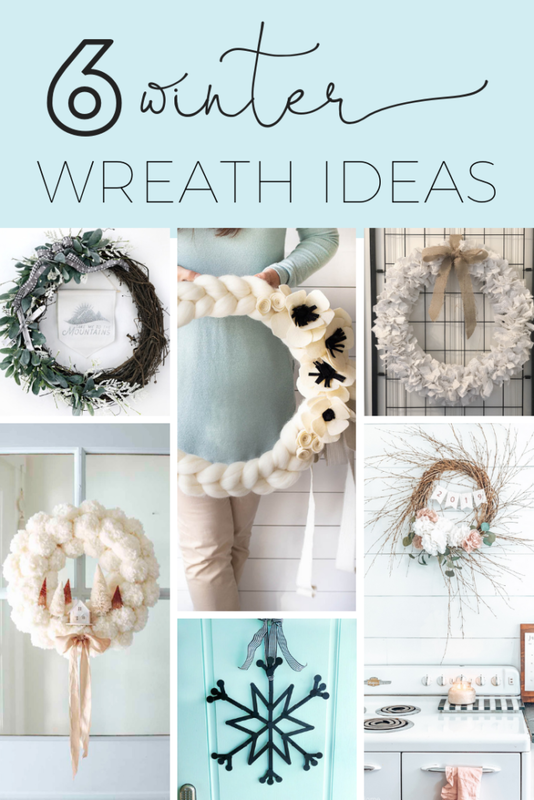 So many great winter wreath DIY’s. Now it’s time for me to share how easy it was to make my chenille wreath. 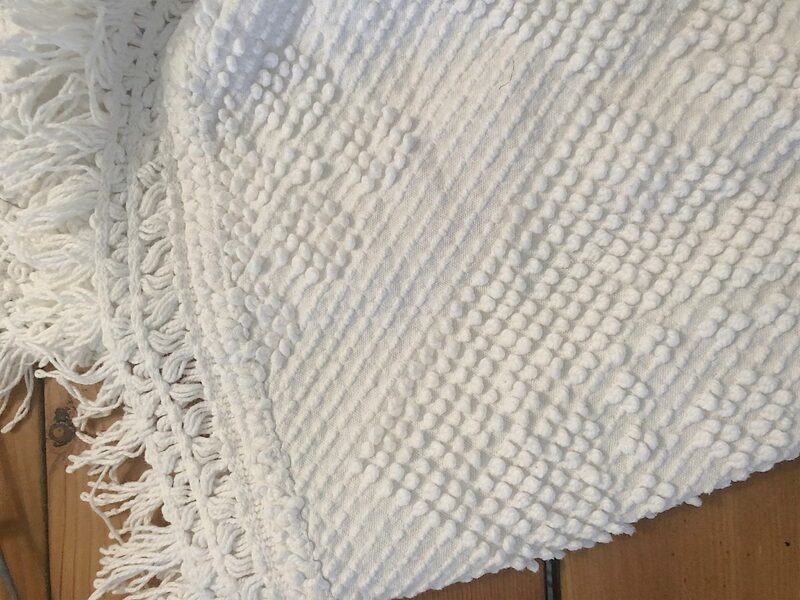 Anytime I see a chenille bedspread at the flea market I try to purchase it. I usually won’t spend more than $20 and I have since learned that I should buy the stained ones. Because that’s the only way I will cut them up for DIY projects. So yes, I have a lot of chenille bedspreads waiting to become a DIY project. But they look too nice to be cut up! 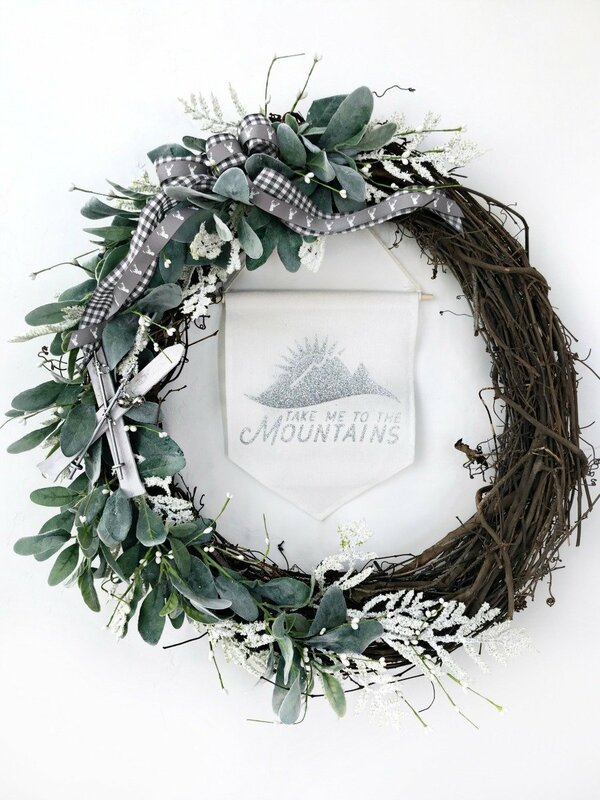 For this wreath, you need a metal (three or four lines) wreath form, fabric or a chenille bedspread, and a ribbon. That’s it! 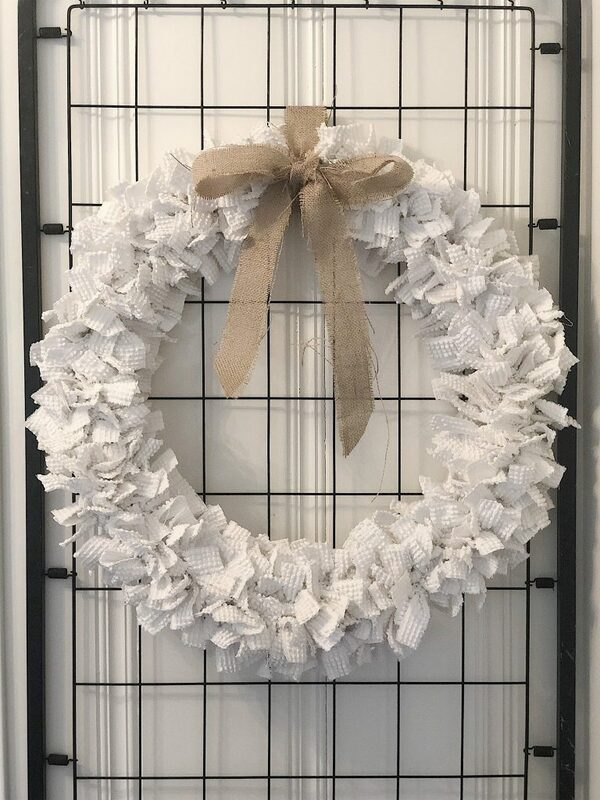 I found a wreath form at a vintage shop for $5 but you can also find these wreath forms at any craft store. 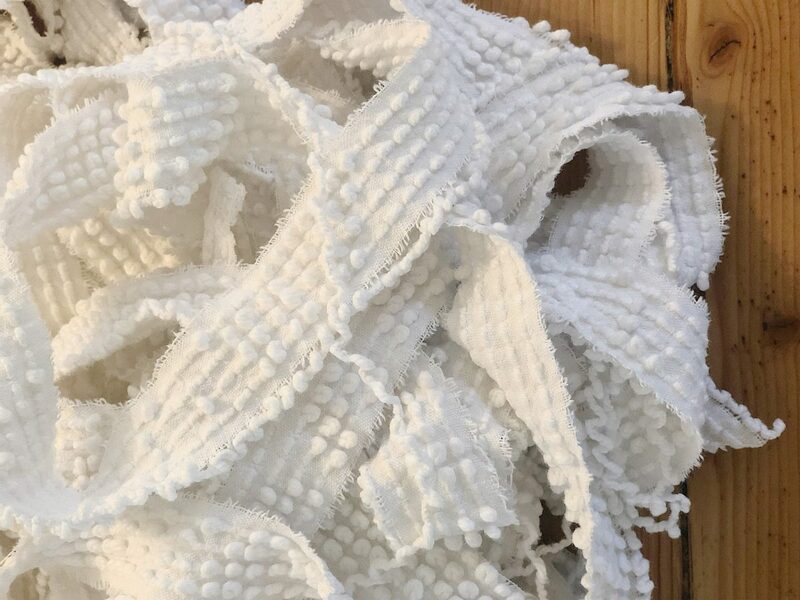 You can use a drop cloth, muslin fabric or even burlap if you can’t find chenille. 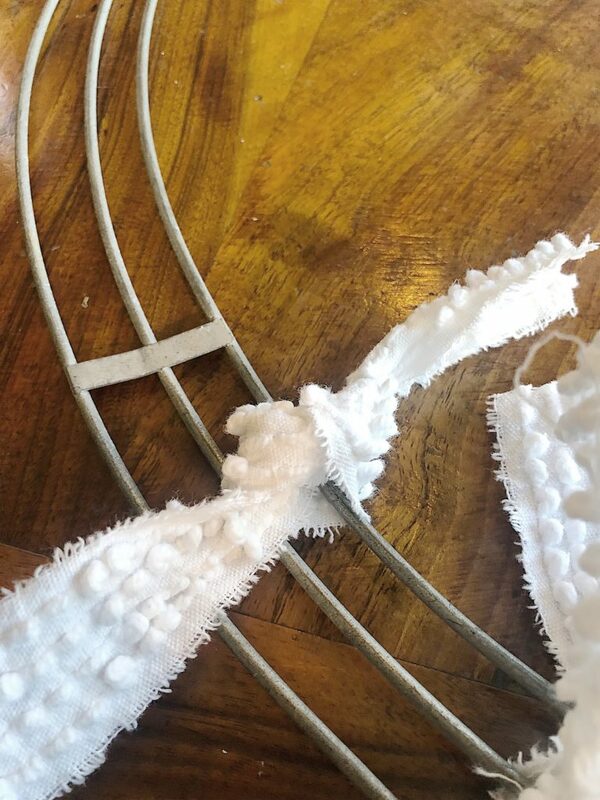 I highly suggest you use a fabric that rips well. If you can tear the fabric you will save so much time! 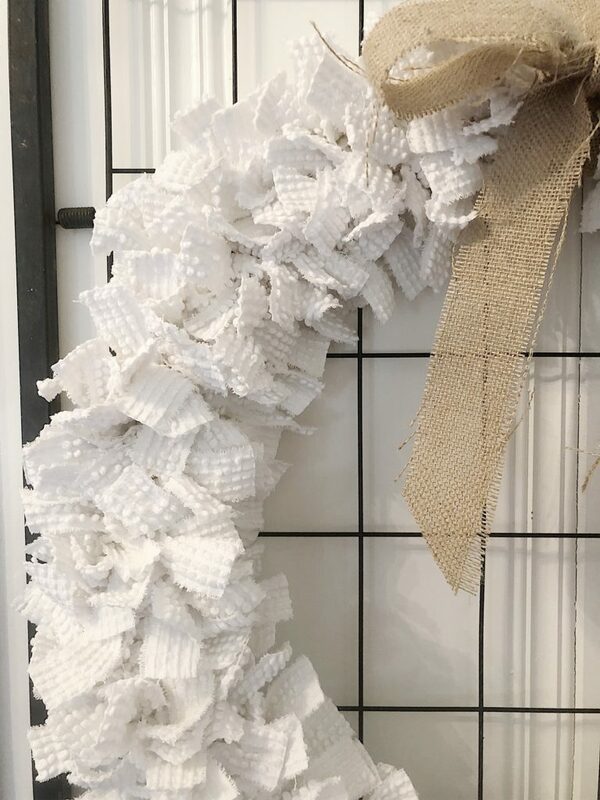 To determine how much fabric you need, you need to start with the size of your wreath form. Measure the distance all the way around the outside of the wreath. My wreath is 24″ in diameter and about 70″ around the outside. 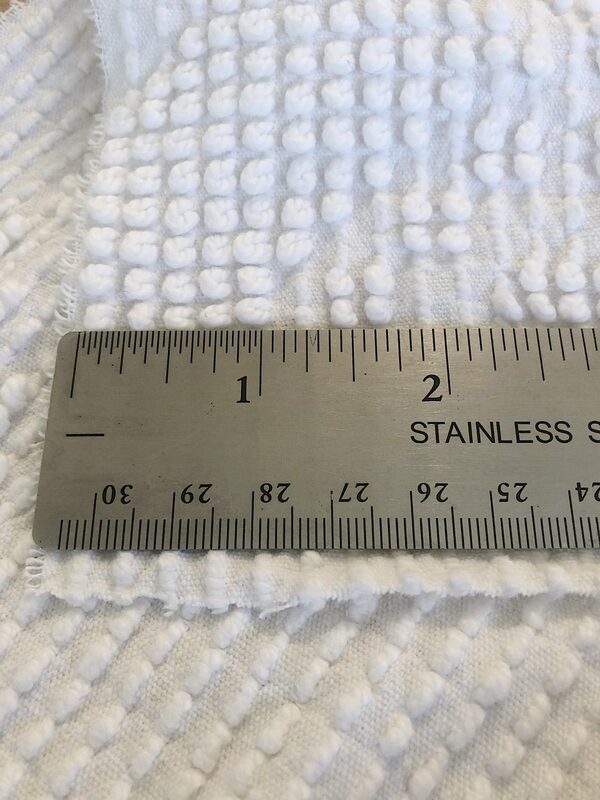 I need about 1′ for every inch on the outside, which is 70″ or about two yards (of 45″ wide) fabric. I suggest you purchase two and a half just to be safe. 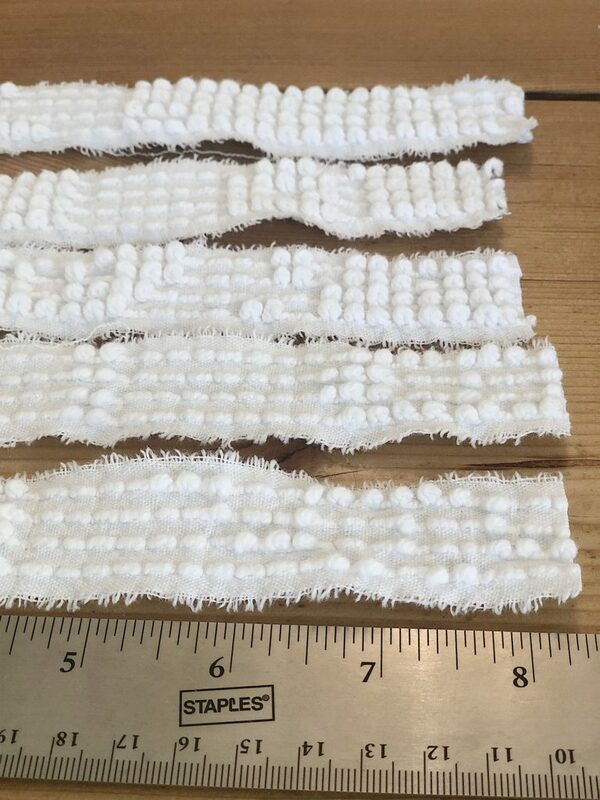 Next, you need to tear (or cut) one-inch strips. 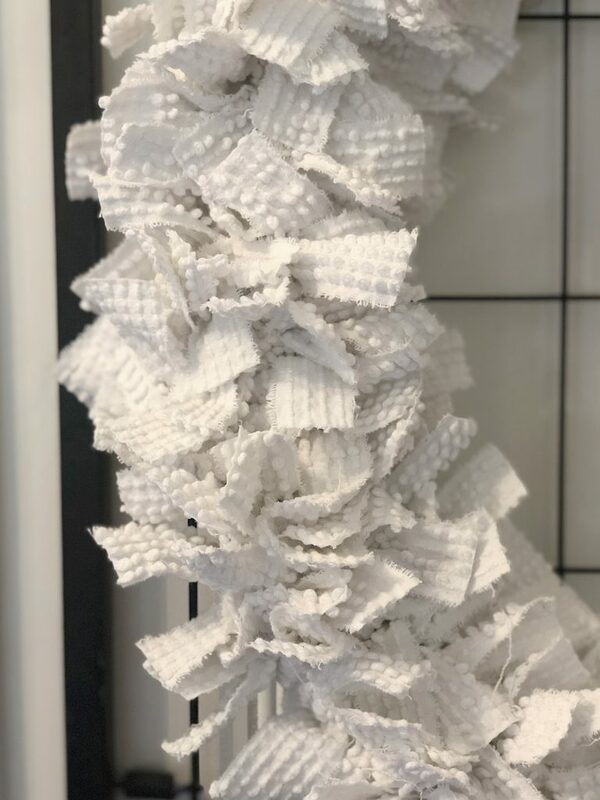 If you are using chenille be sure to tear them in the right direction. My chenille fabric will only tear in one direction. I cut off the trim along the edges and then cut a small slit every 1″. Then I just tore the strips. Next, I cut each strip into 8″ lengths. Then I started tying one strip across each metal rim. Just do a single tie. A double knot is too bulky. 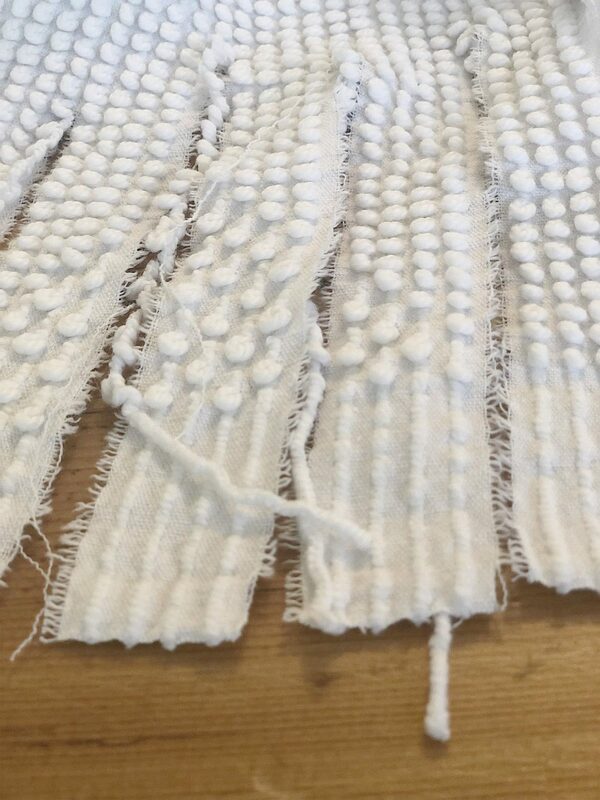 After each row was tied (which was three strips), I pushed them together tightly and started the next row. Here is what the knots look like on the back side of the wreath form. Be sure to push the rows together tightly after each row is knotted. Next, tie a ribbon to the top or bottom of the wreath. I am so happy how easy it was to make this chenille wreath. 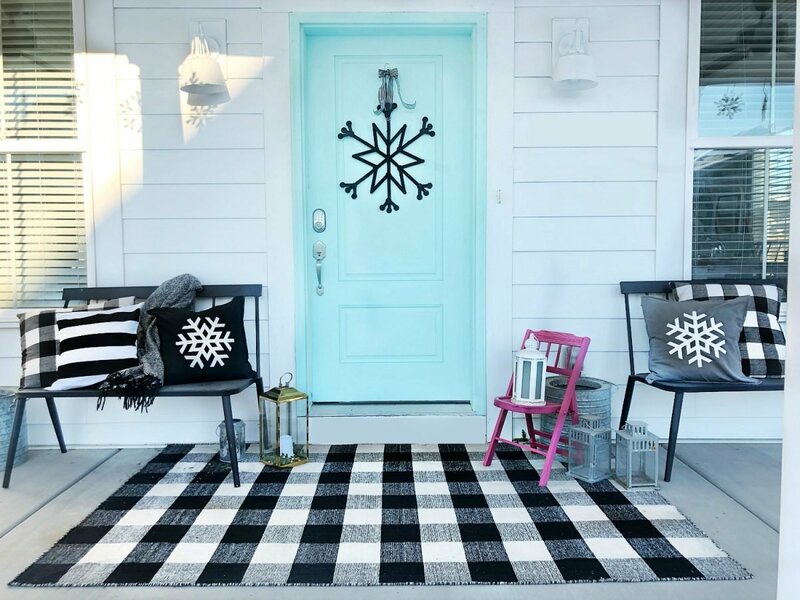 Pin the image below to your winter decor and DIY boards on Pinterest (just click the Pin button in the top left corner). You can also follow along with me on Pinterest! I recently joined your mailing list over the holidays, but have yet to receive an email with your recipes from your Christmas party. In particular, I am wanting your recipe for your smoked turkey on the cranberry orange muffins, but would like to have all the recipes you made as they look delicious. 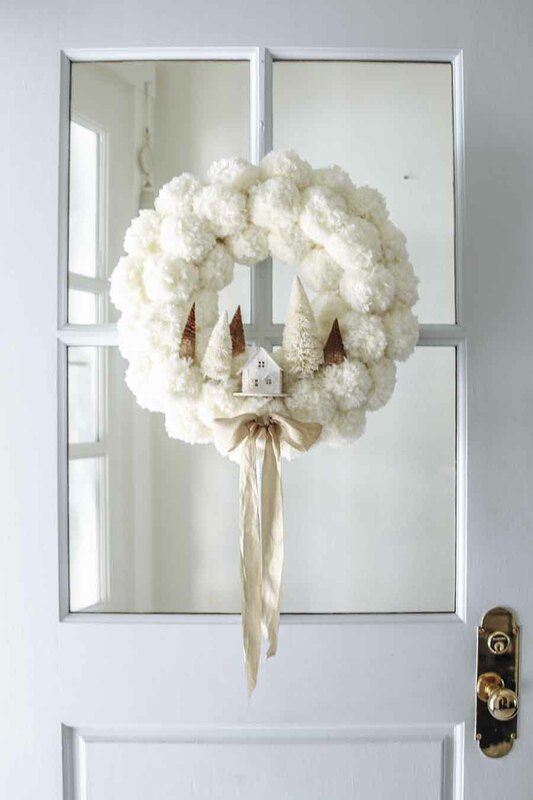 Have never been a fan of pompoms but that wreath is really unique and gorgeous; I also love chenille, my sister used our mom’s bedspread to make little teddy bears for all of us siblings. I really like the idea of a chenille wreath but it looks like a lot of cutting/tying! However, it looks gorgeous and will last a long time. Thanks for the new ideas. My pleasure! This wreath was so much fun to make. It’s pretty much ripping and tieing! Pingback: How to Make an Easy Popsicle Stick Snowflake Wreath - kids craft!